For 22″ to 37″ displays. 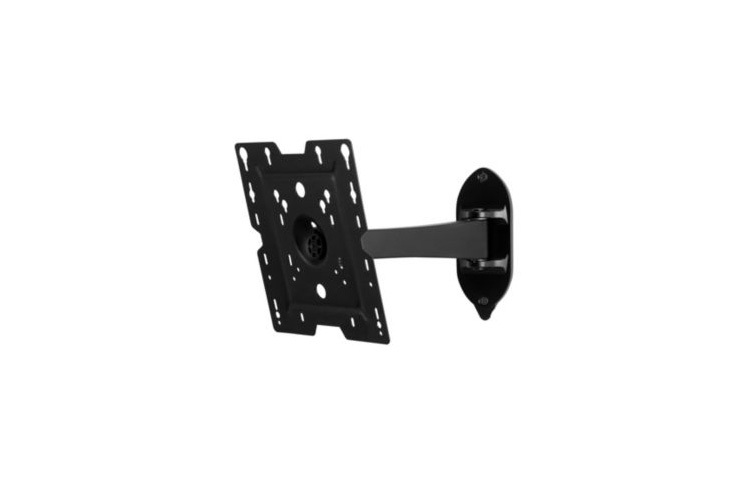 As the signature brand by Peerless-AV®, the SmartMount® series wall mounts reflect remarkable form and function with superior design aesthetics. The pivoting wall mounts feature versatile display positioning and one-person, Hook-and-Hang™ easy installation. The pivoting arm allows you to extend the display up 11.88″ (302mm) from the wall, and can retract to just 2.50″ (64mm) from the wall. The internal cable management provides a clean, professional finish. One-Touch™ tilt of ±15°, ±5° of roll for post-installation leveling, and ±90° of pivot means the display will be perfectly positioned for the optimum viewing angle. Fits 22″-37″ (56-94cm) displays weighing up to 55lb (25kg). Extends display 11.88″ (302mm) from the wall. Retracts to hold display 2.50″ (64mm) from the wall. ±90° of pivot allows for perfect display positioning. Easy leveling ±5° after display installation. Internal cable management provides clean, professional installation finish. Landscape or portrait mounting options increases display versatility. Quick and easy, Hook-and-Hang™ one-person installation. ±15° of One-Touch™ tilt for smooth viewing angle adjustment. VESA® 75, 100, 200 x 100 and 200 x 200mm compliant. Mounts to wood studs, concrete, cinder or breeze block.